Your Adobe Creative Cloud package includes two components: 1) Online access to Adobe Creative Cloud updates on your CourseMate product, and 2) the CS6 edition of your Adobe book. CourseMate enriches your learning with thorough, chapter-by-chapter summaries of the new Adobe Creative Cloud release. Author-created video introductions cover each chapter's learning objectives, emphasizing their importance for the contemporary design professional. Flashcards, quizzes, and games are also included. Your printed book covers fundamental concepts, starting with the workspace and proceeding logically and intuitively to more advanced topics. Step-by-step tutorials and user-friendly design result in a resource that is comprehensive, clear, and effective. Contact your Learning Consultant to learn more about how CourseMate can enhance the way you teach and your students learn. Chris Botello began his career as print production manager for Premiere magazine, designed movie posters for Miramax Films, and served as the art director for Microsoft's launch of sidewalk.com/boston. He is the author of Revealed Series books on Advanced Photoshop, Illustrator, InDesign, and InDesign Interactive and is the co-author of YouTube for Dummies. Chris commutes between Los Angeles, where he works as a designer and retoucher on movie campaigns, and Marion, MA, where he teaches computer graphics at Tabor Academy. 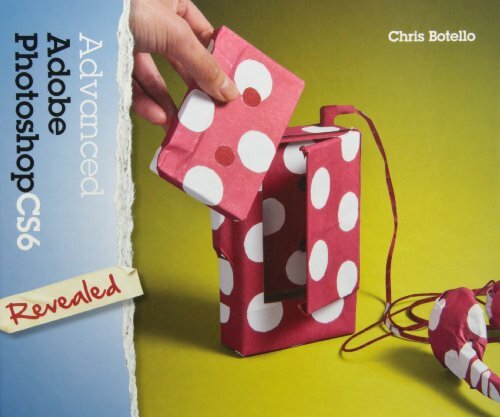 Chris uses his own books - including Adobe Illustrator Creative Cloud Revealed - as the text for his classes. 1. Working with Layers. 2. Working with Layer Styles. 3. Adjusting Levels and Hue/Saturation. 4. Working with Curves and Adjusting Color. 5. Designing with Multiple Images. 6. Investigating Production Tricks and Techniques. 7. Working with Type, Shape Layers, and Filters. 8. Retouching and Enhancing Images. 9. Creating Special Effects. 10. Working with Blending Modes.